KoopaTV: Look to Mario and Cappy to Solve The MICHAEL JACKSON MYSTERY! Left: Michael Jackson posing in the music video for Smooth Criminal. 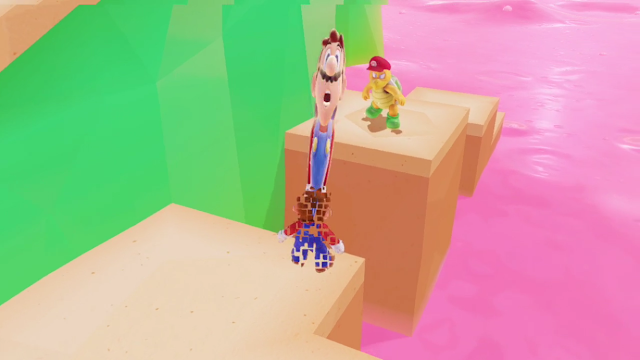 Right: Mario posing in the music video for Jump Up, Super Star! Of course, I'm not suggesting that Mario and Michael Jackson are the same person. However, they are both being influenced by a parasitic existence: A Cap Kingdom entity, known as a “Bonneter”. For Mario, it's Cappy. For Michael Jackson? I don't know, but the cap's name isn't important — we just know there is a whole kingdom of beings composed of Cappy's species. One of them was with Michael Jackson for a long time. You look at Michael Jackson's hat in the above screenshot, and that's pretty close to what those ghost-like caps look like anyway without shape-shifting. I do believe that Michael Jackson was either captured by a cap, or was using his cap to capture other people and change bodies. Just like with Dennis Rodman's own interactions with Cappy, it's hard to be able to chicken-and-egg these things as an observer. The point is that this would explain why Michael Jackson can look so different: He keeps capturing different bodies, while retaining his brain and mind. They do the exact same inefficient spin into hat throw maneuver. That's no coincidence. People don't just naturally come up with that on their own, because it's a dumb waste of time and gives no benefits to the user. Nay, they carry out the same cockamamie contrivance because they are from cognate cultures! Michael Jackson even follows the same logic that Mario and Cappy do: That random destroyed thug was wearing a hat of his own, so he could not be captured. Okay, okay, you want proof that there is something really special going on, and that Michael Jackson MUST be partnering with a Bonneter? Well, just like Mario and Cappy, Michael Jackson and his own hat can also morph with and turn into previously non-sentient objects. Not everyone can do that, believe me. Left: Michael Jackson as some kind of robot thing, keeping his hat. There's clearly some kind of connection between Mario capturing children (see the .gif above) and Michael Jackson's... capturing of children, in another sense of the word. Erm... capturing their imaginations, of course, and their voluntary wanting to be around him back when he was around. This includes playing, among other games, (Super?) Mario Bros. with the Trump children in Trump Tower. What probably isn't voluntary with these children is both Michael Jackson's and Mario's propensity to dangle babies over massive heights and endangering their lives. 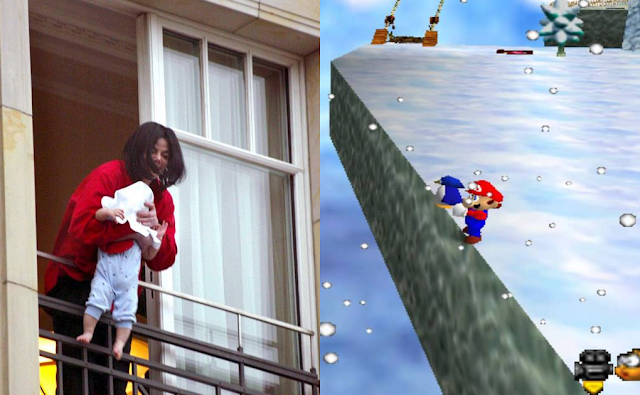 Left: Michael Jackson's famous incident of dangling his baby named Prince over a balcony. Right: Mario's famous incident of dangling a baby penguin over an abyss. ...Not that I'm blaming their headwear on those lapses of judgment. I mean, Michael Jackson wasn't even wearing anything on his head. ...Well, unless his Bonneter counterpart can take the form of a wig. Though it's possible that people with bad judgment to begin with are prime targets for partnership with Bonneters. Indeed, every peculiar aspect about Michael Jackson can be explained if you look at it through the lens of a Bonneter such as Cappy being responsible for it. Different looks? He captured a different person. Weird behaviour? Identity crisis. You think that someone's brain can just keep capturing different bodies and people and even non-people and just be unaffected? You do that enough times, like Michael Jackson over decades, and your mind will deteriorate. That's probably why Michael Jackson died so early. Mario is well on that path himself. The more he will do things with Cappy, the more his lifespan will be cut short. Hideously stretching like this can't be healthy for you in the long-term. Our goal as Koopas is to eliminate Mario even sooner. Every day he's alive means further untold destruction to the universe, so we simply cannot wait. Will you join us? Playing through Super Mario Odyssey, now released, may provide for even more revelations! This article won KoopaTV's Most Humourous KoopaTV Article of 2017 award. Compare these two .gifs of how they interact with their everything. Yo Rawk just because we compare two .gifs in this article (a very, very rare thing for KoopaTV to do, I get it) doesn't mean you can just go in the comments section and compare any two .gifs ever. ...That said, that's the same exact sequence. "Mario is well on that path himself. The more he will do things with Cappy, the more his lifespan will be cut short." I'm pretty sure that's why Charles Martinet sounds aged, even though according to Miyamoto, Mario has never aged. That, my friend, is an oxymoron. Anyway, concerning that GIF where Mario possesses an innocent, WHY WAS HE SMILING AT THE HAT?! He just, looked at it, then smiled! Why?! Anyway, it's clear that something's afoot with Micheal Jackson, but I think it's something more than his hat. Probably the attire? I mean, whenever Mario captures someone, he always keeps the mustache. Perhaps the same applys with the King of Pop's outfit. Anyway, that's my fifty cents. At that moment the kid smiles, it's not the kid in control. It's Cappy and the plumber, and they're smiling because their capture was successful. You know, as opposed to it being unsuccessful, like a botched surgery. Michael Jackson has not only transformed into a robot, but he's also transformed into a werewolf, a zombie thing, and a black panther. Some of those may just be special effects, or maybe that's what they want us to think. AHHHH! WHAT HAPPENED TO ME?!?! It's-a-me, and I got to tell you, something tells me I won't be able to talk to you. Well, see you on the 27th. GET OFF MY WEBSITE YOU VILE PUNK! YOU'RE GONNA GIVE EVERYONE MARWARE. I should have known better than to place a suspicious looking cap on my head, but I did not believe that Gamestop off all places would be complicit with the Cap Kingdom. Now, that I know that Michael Jackson was also a pawn used in their dastardly plans, it makes me wonder just how many people and corporations that they have under their control. First of all, are you okay? Are you safe? Second...I gotta ask since this was my first reaction... were you shoplifting in GameStop? Thankfully, as far as I am aware, I am safe and of sound mind. As for your second question, I was not shoplifting but only trying on the cap to see if it fit. For some strange reason, it was as if the cap itself was beckoning me to place it on top of my head. I still cannot at this moment explain why. ...Well, think about wot you were trying to do with the cap and wot it wanted to do with you. ...Wot happened to the cap after you took it off? Once I managed to pull it off, the cap's effects on me started to fade. Before I placed it on me, the eyes somehow hypnotized me into its submission. I was under its control for maybe five minutes until an employee managed to snap me out of it and I gained back my consciousness. After that event transpired, the manager apoligized profusely, promised to destroy the rest of the Cappy caps, and offered me a different styled cap for no charge. Embarrassed of all the commotion that I caused and now weary of any headware, I refused his offer and left the store with my diginity no longer in tow. Was the different cap a pre-owned one?